After Novak Djokovic claimed the Australian Open title, the ATP season roared into February with multiple 500 level events and a number of 250s on clay and hard courts across the globe. Here is your look at all the action for the month that was. Veteran Jo-Wilfried Tsonga won an all French final in this indoor 250 6-4 6-2 against Pierre-Hugues Herbert. The veteran beat Gilles Simon, Jeremy Chardy and Radu Albot in consecutive matches to reach the final, overall he defeated four French players to win the tournament. PHH upset Denis Shapovalov and Tomas Berdych to reach the final. Bulgaria’s only ATP event was won by the in-form Daniil Medvedev 6-4 6-3 against Marton Fucsovics. Fucsovics had a breakthrough after upsetting Andreas Sepi and getting a walkover against Roberto Bautista Agut in the quarters (then edging Matteo Berrettini in the semis). Medvedev got past Gael Monfils in the semis and prior to that he scored wins against Robin Haase and Martin Klizan in consecutive matches. Medvedev’s win helped him reach the top 15, he’s now 1-1 in ATP finals this year. On clay in Argentina home hero and wild card Juan Ignacio Londero won his first ever ATP title prevailing against Guido Pella 3-6 7-5 6-1 in a huge moment for him. Londero’s breakthrough pushed him to a new career high in the top 70 and he beat clay courters Nicolas Jarry and Federico Delbonis most notably to make the final. Pella had a good month edging Paolo Lorenzi, Diego Schwartzman, Albert Ramos, and Pablo Cuevas to reach the final in what was a tough path for a 250. The first ATP 250 in the States this year saw Reilly Opelka lift his first title in three sets 6-1 6-7 7-6 against maiden finalist Brayden Schnur, a Canadian. Opelka also upset top American John Isner, while Schnur edged Sam Querrey in the semis. Opelka’s powerful serve was a difference maker and he should be a factor in Indian Wells and Miami coming up. The 250 on clay in Buenos Aires resulted in Marco Cecchinato’s third career ATP title 6-1 6-2 against home player Diego Schwartzman. Schwartzman upset Dominic Thiem and also beat Aljaz Bedene and Albert Ramos to reach the final. Cecchinato beat Christian Garin, Roberto Carballes Baena, and Guido Pella to reach the final, three accomplished clay courters. This was a great result for Cecchinato outside of Europe. Gael Monfils returned to form winning his 8th career title 6-3 1-6 6-2 against fellow veteran Stan Wawrinka. It was a thrilling moment played in good spirits and filled with joy for both players who have overcome injuries and adversity to return to the top of the game. Monfils 500 level title included wins against Daniil Medvedev, and David Goffin. Wawrinka upset Milos Raonic, Denis Shapovalov, and Kei Nishikori before falling short in the final. Both players would love to contend at the slam level again. The Rio 500 on clay was the top event on the Golden Swing and Serbia’s Laslo Djere claimed his first title 6-3 7-5 against young gun Felix Auger-Aliassime. FAA played well but Djere was the player of the week, as he upset Dominic Thiem and also claimed wins against clay courters Casper Ruud and Aljaz Bedene to reach the final. FAA defeated Fabio Fognini, Christian Garin, Jaume Munar, and Pablo Cuevas to reach the final, showing his all court talent that is set to make him a top 20 player in the near future. Djere broke into the top 40 with the win, the tournament was filled with upsets. Young gun Stefanos Tsitsipas found form and got past Mikhail Kukushkin 7-5 7-6 in the final after defeating David Goffin, and Sergiy Stakhovsky in the late rounds to reach the final. Kukushkin upset Denis Shapovalov and Andrey Rublev before getting a winnable semi against Ugo Humbert. This indoor hard court 250 saw some early round upsets but in the end the #1 seed Tsitsipas won his second career title. Radu Albot made history, winning his first career title and breaking into the top 60 with a 3-6 6-3 7-6 win against Dan Evans in a battle of journeymen in the Delray 250 hard court final. Evans edged John Isner in the semis and upset Frances Tiafoe in round 1 while Albot got past big servers Ivo Karlovic and Nick Kyrgios before nipping Americans Steve Johnson and McKenzie McDonald to reach the final. Roger Federer won his 100th career title at the Dubai 500 6-4 6-4 on hard courts against the in-form Stefanos Tsitsipas. Federer found form late in the tournament after dropping sets against Philipp Kohlschreiber and Fernando Verdasco in the first two matches. Marton Fucsovics and Borna Coric were his quarterfinal and semifinal opposition, while Tsitsipas had a relatively easy path until Gael Monfils was his semifinal opponent and he prevailed in that match in a third set tiebreak. The young Greek played well but Federer was just too good. The Acapulco 500 was won by the struggling big server Nick Kyrgios 6-3 6-4, as he defeated Alexander Zverev in a battle of talented finalists. Kyrgios was focused on the week, edging John Isner in the semis, Rafael Nadal in the second round, and Stan Wawrinka in the quarters while Zverev had a smooth path that included Alex De Minaur in the quarters and Cam Norrie in the semis. Kyrgios has always had the talent to be an elite player, if he can keep this form he will contend in both upcoming Masters tournaments, but that can’t be predicted. Argentina’s Guido Pella won his first ATP title, winning the 250 on clay to close the Golden Swing 7-5 6-3 against Christian Garin. Pella edged Laslo Djere in the semis, while Garin upset Ruud. Pella didn’t have the toughest draw (Roberto Carballes Baena and Marco Trungelliti) but it was still a massive accomplishment to win his first title. Juan Martin Del Potro won his biggest title in 5 years as he eased past Kevin Anderson 6-4 6-4 in the final. Anderson didn’t appear entirely fit in the final and Del Potro handled his big serve with relative ease. JMDP defeated Mischa Zverev, David Ferrer (in 3 sets), Dominic Thiem, and Alexander Zverev to reach the final, the last three wins high quality results for the veteran Argentine. Anderson reached his third ATP final of the year by defeating Radu Albot, Adrian Mannarino, Hyeon Chung, and Jared Donaldson, the win over Donaldson coming in three sets. Jamie Murray and Bruno Soares won doubles against the Bryan brothers. It was Roberto Bautista Agut’s finest week on the ATP Tour yet. The 29 year old Spaniard defeated Lucas Pouille 6-3 6-4 in the final, and dropped just one set on the week. Despite a weakened field in Dubai, RBA still scored quality wins against Florian Mayer, Pierre-Hugues Herbert, Borna Coric, and Malek Jaziri to reach the final. Jaziri’s dream run in the Middle East coming up short despite upsetting Grigor Dimitrov, Robin Haase, and Stefanos Tsitsipas in consecutive matches. Pouille defeated Ernests Gulbis, Karen Khachanov, Yuichi Sugita, and Filip Krajinovic to reach the final, dropping sets against everyone but Gulbis and showing his mettle in key third setters. His results in Dubai resulted in his third final of 2018 as the Frenchman has been roaring this year. Jean-Julien Rojer and Horia Tecau defeated Cerretani/Paes in the doubles final. Fabio Fognini staved off a valiant effort from the rising Nicolas Jarry to take the Sao Paulo 250 final 1-6 6-1 6-4. The result is the 5th career ATP title for the Italian #1 who wrapped up the golden swing with straight set wins over Joao Domingues, Guillermo Garcia-Lopez, and Pablo Cuevas to reach the final. Jarry had a remarkable golden swing, gaining ranking points by reaching the quarters or better in the three tournaments that he played. He had a very tough week in Sao Paulo as he played five three set matches in total. Dusan Lajovic, Guido Pella, Albert Ramos, and Horacio Zeballos were the players who stood in his path, and he took them all down, winning over Pella and Ramos in third set tiebreaks. Jarry rises to #61 in the rankings, a new career high. Maximo Gonzalez and Federico Delbonis defeated Koolhof/Sitak in the doubles final. The 2018 Dubai Duty Free Tennis Championships are a 500 level stop in Dubai on outdoor hard courts. Normally an event on the elite side of the 500 level, the field is relatively weak this year, opening up opportunities for ranking points and prize money for players outside of the top 10. Here is your full preview, with predictions. Top seed Grigor Dimitrov has put together a solid season thus far. He should defeat local favorite Malek Jaziri, and either Robin Haase or Quentin Halys to reach the quarters. Philipp Kohlschreiber has an advantage to reach the quarters in his section. Kohli hasn’t had a great 2018, but Gleb Sakharov is his first opponent, then Mikhail Kukushkin or Stefanos Tsitsipas, both of whom are struggling. Kohli over the young Greek is my pick, with Dimitrov reaching the semis. Roberto Bautista Agut is looking to get back on track against Florian Mayer first up, with Joao Sousa or Pierre-Hugues Herbert to follow. RBA should be good enough to reach the quarters. The section featuring Richard Gasquet vs. Borna Coric and Benoit Paire vs. Yoshihito Nishioka is the strongest of the draw. Paire and Gasquet have both been solid this year, and Coric has potential. I’ll go with Gasquet over Paire in round 2, with Gasquet knocking off RBA in the quarters. Ernests Gulbis has qualified for two ATP tournaments this year. He’ll open with Marseille finalist Lucas Pouille. Given the fatigue factor, I’ll go with Gulbis to upset Pouille and also defeat Karen Khachanov, who is coming off a big title in Marseille. Khachanov opens with Denis Istomin. Yuichi Sugita or J.L. Struff should benefit big time in this section. Sugita opens with an in-form Ilya Ivashka, who reached his first ever ATP semi in Marseille. Struff faces a struggling Andreas Haider-Maurer. I’ll back Struff over Sugita and Gulbis in consecutive matches to reach the semis. Yannick Maden is moving his way up the ATP rankings but Marseille quarterfinalist Damir Dzumhur should defeat him in the opening round. Evgeny Donskoy reached quarters in Delray Beach and should defeat Blaz Kavcic. I’ll back Dzumhur to reach the quarters from that section. Filip Krajinovic faces Thomas Fabbiano, then Marcos Baghdatis or Viktor Troicki. The younger Serbian should get past Fabbiano and Baghdatis, then fall to Dzumhur in the quarters. This should be Dimitrov’s week. Gasquet has a shot as well. The bottom half is relatively open, but I’ll back Dzumhur to get to the final before falling to Grisha. 29 year old Sam Querrey won the biggest title of his career and returned to the ATP top 30 after a stunning run in the Acapulco 500 level tour stop. Querrey made it nine career ATP titles with a masterful serving performance against Rafael Nadal, prevailing 6-3 7-6 in upset fashion over the fan-favorite Spaniard. Nadal struggled on return and in the second set tiebreak it was Querrey who was clutch. Now 10-4 on the season, Querrey dropped sets against Kyle Edmund and fellow big server Nick Kyrgios on the week, while defeating top 15 players David Goffin and Dominic Thiem in straight sets to reach the final. His serve was strong all week, and perhaps the best match of the tournament was a showdown against Kyrgios where he was able to power past the young gun. Kyrgios upset Novak Djokovic earlier in the week, after Djokovic had survived Juan Martin Del Potro’s challenge. Djokovic’s loss hurts his bid to reclaim the world #1 ranking anytime soon. Nadal moved to 12-3 on the season after posting routine victories over Mischa Zverev, Palo Lorenzi, Yoshihito Nishioka, and Marin Cilic. Despite suffering a shocking defeat, Nadal still has a shot to equal his number of hard court wins last season (18), before the clay court season begins. Rafa has made big strides in 2017 and seems healthier, fitter, and more focused compared to recent years. Jamie Murray and Bruno Soares defeated John Isner and Feliciano Lopez to take home the doubles trophy. Andy Murray claimed his first title of the season and extended his hold on the world #1 ranking with a routine 6-3 6-2 victory against Fernando Verdasco in Dubai. Murray was unthreatened throughout the week, except for two sets of a thrilling contest with Philipp Kohlschreiber. Murray defeated Malek Jaziri, Guillermo Garcia-Lopez, and Lucas Pouille with ease over the course of the week. Kohlschreiber had more than a half dozen match points in a second set tiebreak that finished 20-18 in favor of Murray. The Brit conceded plenty of chances to the German veteran, but he as unable to take them. Kohlschreiber has always been talented, but hasn’t risen as high as he probably should have in his career because of losses like the one he suffered against Murray. With two critical Masters 1000 tournaments coming up, Murray is looking to be in solid form compared to his main rivals at the top of the men’s game. AO champ Roger Federer was stunned in a third set tiebreak against Evgeny Donskoy in Dubai. Donskoy was far behind the Swiss legend, but he didn’t give up, and Federer outright choked in uncharacteristic fashion. Fernando Verdasco, who made the semis in Doha, has really enjoyed playing in the Middle East this year. The 33 year old made the final with wins against Andreas Seppi, Roberto Bautista Agut, Gael Monfils, and Robin Haase. His wins against Haase and RBA came in three sets. It was the first hard court final in six years for Verdasco. Jean-Julien Rojer and Horia Tecau defeated Rohan Bopanna and Marcin Matkowski in a doubles final that featured two teams of full-time doubles specialists. Pablo Cuevas awoke in Sao Paulo, snapping a four match losing streak dating back to January, and going to win the title in the Brazilian destination for a third straight time. The renewed 31 year old won the final stop of the Golden Swing in a Monday final 6-7 6-4 6-4 over Albert Ramos, after rain delayed the match on Sunday. Cuevas posted victories over Facundo Bagnis, Diego Sebastian Schwarztman, and Pablo Carreno Busta as well, with his win over DSS revenge for a loss to him earlier in the season, and a very close three setter. Cuevas now has six career ATP titles, all of them on clay where he plays his best tennis by far. Ramos fell to 1-3 in career ATP titles, but made his fourth title by defeating Gastao Elias, Guido Pella, and Joao Sousa, needing three sets against both Pella and Sousa. The Spaniard’s spin remains a damaging weapon on clay courts, and he’s now 11-7 on the season after making the Quarterfinals or better of every Golden Swing clay court stop. He’s also one of the handful of players to take part in all four Golden Swing tournaments. Home joy was felt for Rogerio Dutra Silva and his fellow Brazilian Andre Sa as they defeated Marcus Daniell and Marcelo Demoliner in the doubles final. The ATP World Tour returns to the Middle East for ritzy 500 level action in Dubai, where a host of elite ATP players are vying for the title. 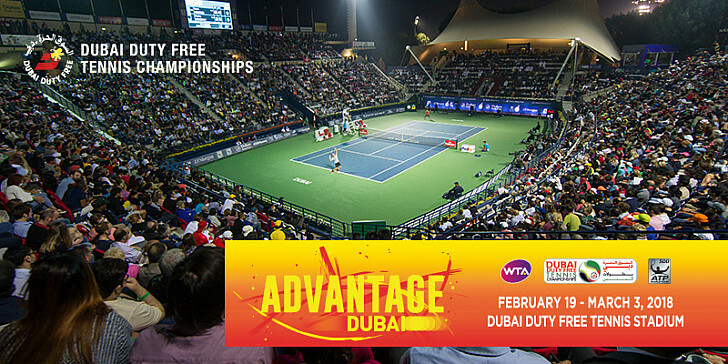 Here is your preview with predictions of the Dubai tennis championships. A solid field features in Dubai, including three top-10 ranked Grand Slam champions. Kohli has yet to find rthymn this season while Muller hasn’t had great draws since winning Sydney. Despite the h2h in favor of the German, Muller should be able to serve well enough to gain a narrow victory in this one. Federer has never lost to Paire, and of course he won the Australian Open. Paire meanwhile has dropped three straight matches after posting an ATP semi a couple of weeks ago. Still this is a great style matchup between one handed backhands, Paire likely doesn’t believe he can win this, but this is a form check match for Federer. Brown hasn’t played well since injuring his back, but he’s still a dangerous serve and volleyer if the surface plays quick. Evans is in the midst of a tremendous 2017, and will look to continue to the momentum in this tournament stop. His one handed backhanded should be good enough to gain a victory, but Brown is a tricky opponent. Andy Murray will start his journey in Dubai against Malek Jaziri, who always gets local crowd support. He should win that match, and then defeat either Guillermo Garcia-Lopez or more likely Viktor Troicki to reach the quarterfinals. Waiting for him in the quarters should be Muller/Kohlschreiber, but Daniil Medvedev is an intriguing dark horse. The Russian has two quarterfinals and an ATP final this season. He’s posted rapid improvements at a young age, and I have him outgunning Muller before falling to Murray in the quarters. Seven-time Dubai champion Roger Federer will face a qualifier or Mikhail Youzhny after taking on Paire. Federer should beat the veteran Youzhny, and then face the finalist in Marseille Lucas Pouille. Pouille found form in France and should put away a struggling Adam Pavlasek, then J.L. Struff or a qualifier to reach the quarterfinals. A fresher Federer has the edge on Pouille. Defending champion Stan Wawrinka starts his title defense against Damir Dzumhur, with Jiri Vesely or Marcel Granollers to follow. None of the players in this section are in great form, Wawrinka should be fresh and focused though. In the quarterfinals Tomas Berdych, 8-3 in 2017, looms. Berdych faces a qualifier first, with Robin Haase or a qualifier to follow in a weak section. Wawrinka leads the h2h with Berdych 11-5 and has dominated the matchup recently, he should reach the semifinals. Two talented shotmakers, Roberto Bautista Agut and Gael Monfils, should face off in the quarterfinals. Monfils faces wild card Mohamed Safwat, with Evans/Brown to follow, while RBA will face a struggling Karen Khachanov, with Florian Mayer or Fernando Verdasco to follow. Only RBA has form in this section and should reach the quarters. Monfils has a 3-0 h2h against RBA and is the favorite to reach the semifinals. The Monfils/RBA section is the weakest part of the draw, creating an opening for Evans to perhaps reach the quarterfinals or better if he plays his best tennis. The Brit is a solid part of the ATP tour at this point, but with his game still improving, he could become more than that. Federer has won five straight against Murray, while Wawrinka has a 3-2 h2h edge over Monfils. Given his form in Melbourne, Federer is the favorite against the world #1. Federer has a 19-3 h2h win over Wawrinka and a h2h this year, we could see an all-Swiss final, and Roger will be the favorite. Dominic Thiem continued his MEGA season with his second ATP title this month in Acapulco. The 500 level tournament is his biggest career result thus far and the 22 year old Austrian is making a push for the top 10. Thiem scored a comeback win in the final 7-6(6) 4-6 6-3 over Bernard Tomic after Tomic was up 4-1 and 5-2 in the first set. Tomic had a good tournament and showed his own flashes of greatness but the 23 year old Aussie could maintain a consistent high level compared to Thiem’s newly aggressive tennis this year. Thiem is 18-4 on the season with room to grow as he has two titles, and two semifinals already this year. He beat Damir Dzumhur, Grigor Dimitrov, and Sam Querrey in resounding fashion without dropping a set, and also came back from a set down against Dmitry Tursunov in his second match. The former top 15 player Dimitrov was plainly outclassed by Thiem who is two years his junior. Tomic moved to 12-6 on the season and posted his best result after a post Australian slump. He got revenge against Rajeev Ram for a loss earlier this month, and then beat Adrian Mannarino, Illya Marchenko and Alexandr Dolgopolov to reach the final. Dolgo was on fire in the opening set, and had his chances in sets 2 and 3, but somehow Tomic dealt with his shotmaking to advance. Dolgopolov upset David Ferrer early in the tournament, and the other favorite Kei Nishikori lost to Querrey. Veteran Max Mirnyi teamed up with Treat Huey to defeat Alexander Peya and Philipp Petzschner in the doubles final. Mirnyi needs a couple more wins to make it 700 in his doubles career. The 500 level stop in Dubai saw world #4 Stan Wawrinka capture his second ATP title of the season. Wawrinka had a surprisingly easy path to the title after world #1 Novak Djokovic withdrew with an eye infection. Against unseeded veteran Marcos Baghdatis, he dazzled with his backhand in a great display of offense against offense from the baseline for a 6-4 7-6(13) victory. Wawrinka had to fight back from a set and a break down, and work through a tough third set to beat serve and volleyer Sergiy Stakhovsky for the second week in a row, he was looking shaky early on, but wins over Franko Skugor and Philipp Kohlschreiber gave him momentum. Nick Kyrgios met him in the semifinals, as he had another good week on tour, but a back injury forced him to retire in set 2. The Cypriot Baghdatis reached his first tour final since Atlanta last year, and he did so with surprising wins over Viktor Troicki, Vasek Pospisil, Roberto Bautista Agut, and Feliciano Lopez, dropping just the first set to Lopez en route. Troicki and RBA had been in good form as of late, but both looked exhausted in sloppy second sets against the 30 year old. Italians Simone Bolelli and Andreas Seppi won 14-12 in a third set super tiebreak against the Spanish Lopez brothers Feliciano and Marc to capture the doubles title. Lopez still had a great week overall with a semifinal in singles and a final in doubles after a slow start to 2016. Pablo Cuevas defended his Sao Paulo title and won his second tournament in a row to move to 12-3 on the season, and cement his status as one of the best clay courters on tour. Cuevas is 10-1 on clay this year and dominated the Golden Swing with a quarterfinal in Buenos Aires, and titles in Rio and Sao Paulo. His Sao Paulo triumph came with little signs of fatigue in a 7-6(4) 6-3 victory over Pablo Carreno Busta. He also beat Facundo Bagnis, the young upstart Thiago Monteiro, and Dusan Lajovic this week, dropping just a set to a promising Monteiro in some rather quick matches. Monteiro is 3-2 on tour this year after making his ATP main draw debut in Rio. Carreno Busta was bageled in his opening set of the tournament against Albert Ramos but survived a third set tiebreak, and then went on to beat Daniel Gimeno-Traver in three sets, Roberto Carballes Baena, and Inigo Cervantes, in quarter and semifinal blowouts. It was the first ever ATP final for Carreno Busta, but victory was not to be had as Cuevas proved too strong. Pablo should be a threat on European clay in the spring as well. Julio Peralta and Horacio Zeballos won the doubles title over Carreno Busta/David Marrero. The ATP World Tour will stop in the middle east once again for the 500 level hard court tournament in Dubai. The Dubai field has a big drop off outside of the marquee names, but it’s still a quality 500 level tournament. A battle of veteran Spaniards who have split their career hard court meetings. The serve and volleyer Lopez and the all-courter Garcia-Lopez have both gotten off to poor starts this season, and badly need to get in rhythm. Lopez should have a slight edge to snap his two match losing streak and reach round 2 on this fast surface. Lopez is a two-time former finalist in Dubai. Pospisil has lost four straight, while the qualifier Pouille has an ATP quarterfinal already this season. Pospisil should serve well, but Pouille’s forehand gives him an edge to notch an upset and reach round 2. The veteran Baghdatis has 3 ATP wins this season, and a 4-1 record on hard courts against Troicki. The Serbian has been off the charts recently with a 12-4 record to start the season. With Troicki in fantastic form, he should edge Baghdatis, and perhaps post another deep run at this tournament. The Rotterdam champion Klizan is 8-1 over his last nine matches, Kyrgios comes off his first ever ATP title in Marseille, as both are in fantastic form, and unfortunately one of these players has to suffer an early exit. Kyrgios is the stronger player if he can continue his momentum. Novak Djokovic suffered a hard court loss in 2014 to Tommy Robredo, but he hasn’t lost a match in 2016 and he’s far and above the #1 player in the world right now, especially on a fast hard court. He should beat Robredo and ease past either qualifier Mikhail Youzhny or wild card Malek Jaziri for a spot in the quarterfinals. Youzhny is on an incredible 17 match winning streak, mostly at the challenger level, and the Russian veteran has fought his way back into tour level form after previously being a top 10 player. Expect to see more from him this year. Jaziri by contrast is off to a dreadful start to the season. Lopez/Garcia-Lopez will face wild card Yuki Bhambri or Lukas Rosol for a spot in the quarterfinals. Bhambri hasn’t won a match this season, while Rosol is on a two match losing streak. I give Rosol a slight edge over Lopez to reach the quarters, though Djokovic is unlikely to drop a set en route to the semis. 4 seed Roberto Bautista Agut, and 5 seed Viktor Troicki are two of the most in-form players thus far in 2016. They are on track for a quarterfinal meeting, presuming RBA can handle Italian veteran Simone Bolelli, and then Hyeon Chung/Andreas Seppi, and Troicki can beat Baghdatis and the Pouille/Pospisil winner. Chung could use a win over Seppi to get his season going, RBA beat Troicki in the Sofia final, and thus has the edge to reach the semis. RBA has two ATP titles, and just three losses this season. Stan Wawrinka suffered an early exit to his friend Benoit Paire in Marseille, and he is in shaky form right now. A struggling Sergiy Stakhovsky isn’t likely to oust him in round 1 though, Wawrinka beat Stako in a third set tiebreak in Marseille last week 10-8 in the 3rd. Wawrinka’s round 2 opponent will be either Teymuraz Gabashvili or qualifier Franko Skugor. The veteran Gabashvili can peak and win big matches, but Wawrinka is a clear favorite for the quarters. Philipp Kohlschreiber is 5-2 in recent tournaments, he’ll open with struggling wild card Marsel Ilhan (1-4 in 2016). Kohli has a clear path to the quarters if he’s not upended by young gun Borna Coric in round 2. Coric opens with Jiri Vesely. Vesely has struggled in 2016 (1-4 record), while Coric has been poor since reaching the Chennai final to start the season. Kohlschreiber’s form should allow him to reach the quarters. Wawrinka has never played Kohlschreiber on hard courts, and he should be on upset alert in the quarters. Both players have nifty one handed backhands, and I still give Wawrinka the edge to reach the semis. Former Dubai finalist Tomas Berdych is also a favorite for the semis. Berdych opens with Joao Sousa, who is struggling mightily as of late, and then will face Thomas Fabbiano or Leonardo Mayer, both of whom have limited weapons compared to his power hitting game. Berdych could face Nick Kyrgios, who beat him in Marseille, in the quarters, if Kyrgios beats Klizan and Mikhail Kukushkin/Denis Istomin. Istomin hasn’t won a match in 2016, while Kukushkin retired in his last match. Given the fatigue factor, I have Berdych avenging his loss to Kyrgios and reaching the semis. Berdych also beat NK this year at the AO. The unseeded young guns Kyrgios and Coric could reach the quarterfinals or better in Dubai. Kyrgios demonstrated his full range of attacking tennis in Marseille, and clearly has the talent to compete with the best in the game on a week to week basis. Backing up that Marseille win with another big semifinal would be a huge result for him, and we’ll see if it it comes to fruition. Djokovic has two previous wins in Dubai over RBA (3-0 h2h), even with RBA in the form of his career, the Serbian will have to beat himself to lose. Berdych has had little success in recent years against Wawrinka, but Stan seemed off in Marseille, and I think the Czech will take advantage on a fast surface and reach the final. Djokovic hasn’t lost to Berdych in the last three seasons, and given he beat Tomas in Doha, this result is unlikely to be different. Novak is the clear favorite to continue his winning streak this week in Dubai.